"Top Discos At Great Prices. Requests Welcome." Required by many venues, Event Wales Discos has a current PLI policy with National Association of Disc Jockeys in the amount of £10 million. Also required by many venues, Event Wales Discos has supplied satisfactory evidence of holding current PAT inspections of their equipment dated within the last 12 months. A Method Statement outlining Event Wales Discos&apos; Health & Safety procedure for setting up disco equipment has been provided. Event Wales Discos has provided Risk Assessments undertaken at events sourced via needadisco.com, indicating that they can undertake these competently. Why do people choose to book Event Wales Discos? quick response, answered all my questions and would appear to be ideal for our event. "Would 100% use Greg again. " 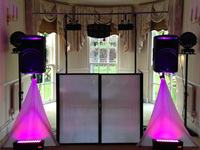 "Our dj Greg was very helpful and accommodating and we couldn't have asked for better. I would book him again and highly recommend him. He did a disco for a 3 generation birthday party and pitched it absolutely perfectly. Many thanks"
Event Wales Discos also offers a range of additional party services not directly linked to musical entertainment. Get FREE no-obligation disco quotes from Event Wales Discos and other DJs covering your venue. Take 2 minutes to fill in some basic details and we'll do the rest! If you are contacting Event Wales Discos about an event, it's always a good idea to include the DATE, LOCATION, EVENT TYPE, AGE GROUP and TIMINGS to speed things up!